The customer must first send a multiple of 0.01 to a Bitcoin address provided by Satoshi Rat. On making the payment the customer must use an address that they expect to be paid with In case they win.If the player sends more than the requested amount, they will be entered for more games. For each race the rats run, they continually get tired and lose some health. This has an effect on the form of the rat in the races since the sicker and tired a rat is, the lower the speed it can reach. So it is advisable to give the rat some time off and soon it will recover gradually to full health. All the money placed as bets is rewarded to the rats. Each rat will win some BTC based on its respective positions attained in the race. (1 – 51% of all bets 2 – 51% of the remaining bets and so on. The house does not keep a thing, not even a satoshi. If the player does not want to wait for his rat to recover naturally, he should pay some bribe to receive some steroids, and the rat will run with full health and stamina just like a normal rat. But after the race, when the steroids wears off, the rat will get back to its former state and even lose some health and stamina like usual after a race. A bribe for one game costs 0.001. If a player is to give a bribe he is advised against doing so for one game since it is costlier to do so. 0.011 – you pay for one game and for one bribe.In consequence your next game will be a bribed one. 0.017 – you pay for one game and for 7 bribes. You next 7 games, already submitted or that you plan to pay for them later, will be bribed. 0.124 – you pay for 12 games and for 4 bribes. 0.129 – 0.009 is a special bribe. You pay for max(12,9). In this case you pay for 12 games and 12 bribes. The rat which finishes last is always given a free bribe as a sign of compassion. If a player`s rat has been under performing, the player might consider to take the rat for augmentation. This is the act of improving the rat implants that are readily available at the doctors` office on the casino.This creates an advanced super-animal superior to an ordinary one. All this is done at a fee which is predetermined and the player has to pay the exact amount if he needs to take his rat for an augmentation. But even if the player has the money augmentation is restricted to the purchase of one item at a time. Bypass of the pain sensors. No matter how tired or injured your rat is, he will run like a normal rat. This is the same as paying bribes for a game. The rat keeps his balance way better with this new tail. Metal Claws –The rat has a better grip of the ground. Currently there is a promotion on augmentation such that, all rats that are unlucky to lose more than 0.05BTC will receive 2 augmentations worth of 0.1105BTC for free. In this game all that matters is the speed of the rat. So it is very important to know how to choose a rat that is faster than the others or even has more potential than the others. The speed of the rat is calculated in some very simple steps. First the customer should find the list of the rats plus the game ids and provided on the casino the customer should then take the published server seed, add it to the gameid and the number 1 or 2, he should then add to it the first 5 letters of all participating rats in alphabetical order, then he should add the first 5 letters of the rat he wants to compute the speed for, then do a sha1 of the mixture, then take again the 5 letters and transform them to decimal, he should then make a mod(number of dice faces used) and that is the speed of the rat. Is Satoshi Rat Provably Fair? 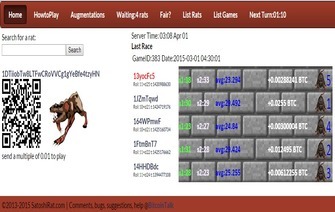 Yes, for every 10 races hosted from Satoshi Rat the website will use a new server seed which can be verified within our provably fair game section. The site has provided the players with big list of rats to choose from. This gives the players a variety of options and can shift from one rat to the other if they stopped performing according to their expectations. Also the player can improve his animal according to his preferences through augmentation. The casino also provides the players with a chronology of the rat`s performances in the past games. This enables the player to choose,according to him, the rat with the biggest potential. Also through this list the player can see at what stage of the curve the rat is i.e whether it is tiring or recovering. In order to play a game at satoshirat, the gambler only requires a bitcoin wallet address only. This simplifies the registration process therefore making the player not to be put down by the sometimes lengthy and mostly annoying registrations associated with other casinos. The designers and developers of the site satoshirat did a great job in creating a simple to use gambling type atmosphere. The user interface is great and will keep the tongues of real gamers rolling. This is especially important to those customers that are not keen on a lot of details but love gaming. The use of bitcoins as the medium of exchange further makes the life of the player easy on the casino. This is because, apart from being convenient, the use of bitcoins is cheaper since there are no transaction processing fees involved in sending and receiving the money. The house is very bold when it comes to the matter of security. They say that they have a security system that has been not been breached to date. They say they have measures put in place to enhance their near perfect security system. This includes the use of a file transfer protocol that encrypts any data sent either from the customer to them or from them to the customer. This ensures that no third parties are involved in the transactions without due permission from either party. The customers` privacy has been catered for here by no even asking for their details in the first place. To play the only thing required is the bitcoin address and no further details are demanded. And therefore the player can play without worries of anything happening to the data given to the casino because there was no important information given out in the first place. With all the above stated limitations, it seems as if the casinos customers are not concerned by them. This is because the figures are always on the increase every day. The game itself is an interesting game, given the adrenaline rush experienced throughout a race. With increased improvements and corrections to the limitations highlighted above,the casino is surely going to be a big hit among the gaming community. The game has a lot to offer not only on the earnings but also on the entertainment and so with good service, gamblers will always be flocking into the casino for both.